Our review copy was kindly supplied by Coerceo Company. Thanks a lot! You may have heard of Coerceo already – just last week it won an award that is almost as prestigious as the Spiel des Jahres: the Mensa Select award 2012, awarded by the American Mensa high IQ society. That tells you something about Coerceo right there: if you were looking for a light dice game to play while watching TV, you’re in the wrong review. But I have good news as well: if you’re one of those people who took weeks to understand how Castling works in Chess – like yours truly – that’s absolutely no reason to be afraid of Coerceo. There is only one type of game piece, only one kind of movement and all the rules can be explained in five minutes. Don’t believe me? Then start your stopwatch now and read on. The game board starts out hexagonal – yes, I said the game board starts out hexagonal, it will change shape later – and consists of 19 hexagonal tiles. 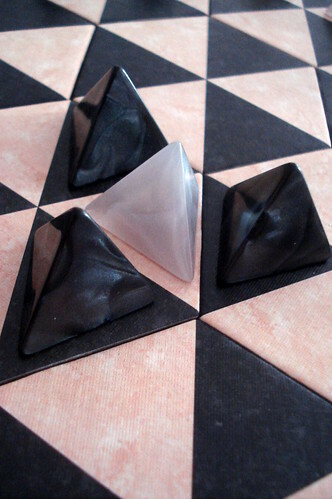 Each tile, in turn, has six triangular fields, three black and three white. The beginning board is actually built the same way as the board of Settlers of Catan. Each player has 18 nice, solid, pyramidal pieces in their colour. These pieces are arranged in three circles of six each, and the black and white circles alternate around the board. It’s hard to explain in words, but perfectly obvious when you look at the picture? What? No pictures are not considered cheating when I promise the explanation only takes five minutes. 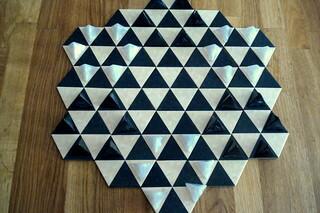 All white pieces start out on white triangles, all black pieces start out on black triangles. Your move is very simple: you move one of your pieces to another field of the same colour that has one corner in common with the current field – thus, you can never get to a triangle of the other colour. For me, it’s easiest to think of it as turning the pyramid around one of its corners, ignoring enemy pieces and the edge of the board. If, after that move, you have an enemy piece completely surrounded, either between three of your pieces or between two of your pieces and the edge of the board, that piece is captured and removed – hence the name Coerceo, latin for “I surround”. If you move yourself into a surrounded position, however, you are not captured, which just goes to show that no one will bother you if you just act like you own the place. Check your stopwatch, we’re halfway there. Still missing is the part where the board changes shape. When you move the last pyramid from one of the board tiles, and that tile only touches three or fewer other tiles, you may remove the tile and keep it. (The at most three tiles also have to be adjacent to each other, that’s just to prevent you from splitting the board). Any enemy pieces that are now surrounded by the new edge and two of your pyramids are immediately captured. Any board tiles that are empty and can now be removed according to the rules also go to you. When you have two conquered tiles you may, instead of your normal move, discard them and remove any enemy piece from the board. If that results in the removal of a tile, that tile is removed from the game immediately, it doesn’t go to either player. The game ends when a player’s last piece is captured, or, with the tournament rules, when one player captures the sixth or twelfth enemy piece. Stop your stopwatch, we’re done. That’s all the rules to play Coerceo. And I even had time left for background information and witty banter. Not bad, huh? You can't run. Hiding is not looking good, either. Now you know how to play Coerceo, but you might still be uncertain about the why. After all, the rules are so simple, there can’t be much depth in it, right? Wrong. The rules for Coerceo may be very straightforward, but playing the game certainly isn’t. You have to plan ahead to avoid being captured at every corner, maybe not as far as in Chess but at least for a few turns. And only moving one field per turn may sound like the game moves slowly – at least that’s what I thought when reading the rules – but the distributed setup can make you retreat into a trap faster than you think. And where Chess, Checkers and almost every other game that lets you capture enemy pieces give you more space the longer the game lasts, Coerceo keeps shrinking the board and restricts your movement more towards the end, not less. The hardest thing to get used to, however, is the threat of suddenly disappearing board tiles – I still lose many pieces because they get trapped between two enemy pyramids and the new edge of the board. It’s a situation that other games don’t train you to watch out for. Making things a bit easier is the option to remove opposing pieces by discarding board tiles. Some may think that this move is too powerful – especially when they’re the victim of it – but this power makes removing board tiles very attractive and another important thing to watch out for. When your choice is to let your opponent capture one of your pieces or let him remove another tile from the board, the choice is not at all obvious. Besides that, the power to remove enemy pyramids anywhere on the board also speeds up the game and reduces the chance of ties. They still happen, but not as often. Coerceo is a very satisfying game to play. You can’t really play a purely defensive strategy as there is no way to block your opponents movement, so there is always something happening on the board, the game always moves forward. And although there are only eight possible opening moves – all the rest are the same eight mirrored or turned – the disintegrating board puts you in new situations every time you play. Playing Coerceo is definitely hard work for your brain, you’ll notice that after playing a whole evening. The Mensa Select award is thus well deserved, and for everyone interested in abstract strategy games Coerceo is a hot recommendation.